Maryland is a land of rolling hills, brilliantly colored cliffs, and expansive beaches. Resting on the shores of Chesapeake Bay and the Atlantic Ocean, this beautiful state offers tremendous water sport opportunities. Maryland also hosts a portion of the famed Appalachian Trail. The landscape of the Old Line State is so diverse that it is sometimes called "America in Miniature." 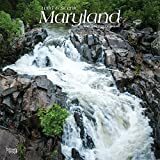 Celebrate wild and scenic Maryland with this magnificent square wall calendar. Maryland is a land of rolling hills, brilliantly colored cliffs, and expansive beaches. Resting on the shores of Chesapeake Bay and the Atlantic Ocean, this beautiful state offers tremendous water sport opportunities. Maryland also hosts a portion of the famed Appalachian Trail. The landscape of the Old Line State is so diverse that it is sometimes called America in Miniature. 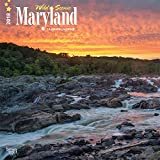 Celebrate wild and scenic Maryland with this magnificent square wall calendar. John Senex's colorful 1718 map of the mid-Atlantic seaboard centered on Maryland, Virginia, and the Chesapeake Bay region forms the cover image for this handy weekly appointment calendar book. Especially if this is an area you know and love, this is a real treasure to decorate your desktop and help you manage your time! This full-size (8.5 x 11 in.) calendar planner book will dress up your desktop with its colorful cover image of John Senex's early 18th-Century map of the Chesapeake Bay region. Softcover. 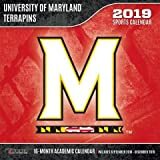 This handsome planning calendar book will grace your desk with its 1879 map of Rockville, Maryland showing many tracts of adjoining land with the names of their owners. Softcover, 8.5 x 11 in. format.